Talk face-to-face with loved ones EASILY. The Konnekt Videophone, a hearing impaired phone, is LOUD and clear, thanks to the two LARGE in-built speakers – MUCH bigger than the speakers in an iPad, tablet or laptop. The volume is adjustable so if your hearing deteriorates, a quick call to Konnekt is all it takes. The 2-way video assists lip reading, deaf sign language, Auslan, video relay and screen-sharing of text or images. Need a hearing aid phone? Videophone won’t interfere. There’s a hearing aid loop output, and Auto-answer for nominated carers. The ringing volume is separately adjustable and can be made EXTRA loud. When someone calls, you can hear the ringing from several rooms away – even if you’re a little hard of hearing. We can make your Videophone EXTREMELY loud if you have trouble hearing, or softer if you must use it in a room shared with others. The Konnekt Disability Videophone includes an amplified speaker, with separate sound control, for those who need even more volume. The sensitive microphone conveys every nuance in your speech, and lets you walk around the room and do other things while you talk in your normal voice. It will also hear you call for help from another room. Videophone is ideal for those who are hard-of-hearing. The large 38cm screen is big enough for you to lip read or use sign language. In addition, your contacts can screen-share from any PC or MAC computer, so they can display text on your Konnekt hearing impaired phone by typing on their computer or by using their computer’s voice-recognition software. At your end, there’s nothing at all that you need to do – just watch the text magically appear! 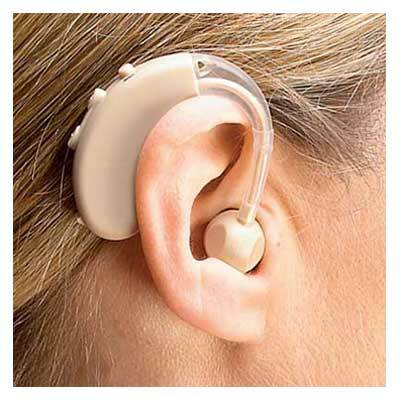 If you use a hearing aid, you can plug a hearing-aid loop into the standard 3.5mm audio output socket. Konnekt Disability Videophone can turn on lamps in other rooms whenever someone rings! Ask us how. Face-to-face calls with friends and family. Loud and hi-fidelity sound from two large, in-built speakers. Much louder than tablets or laptops. Especially loud ringtone available, audible across many rooms. Audio output for hearing aid loop. Audio input from a speech generating device. Huge 38cm screen. Ideal for sign language / lip reading. Use a Video Relay sign language translation service. Friends can show you text from their PC/Mac, using Notepad or voice-to-text software. Auto-answer option for trusted carers. Reduce their worry when you can’t hear the call.